My Dad is a recently retired airline pilot. When I was younger, he used to bring me home treats that they served on the flight and he "appropriately" wrapped them in a sickness bag. Contrary to the typical notion people have when they see a sickness bag, I smile when I see him holding one. I would shout, "Is that pasalubong (treat) for me?!" That meant he brought me home a slice of my favorite pineapple upside down cake. It wasn't the best pineapple upside down cake but I was happy. 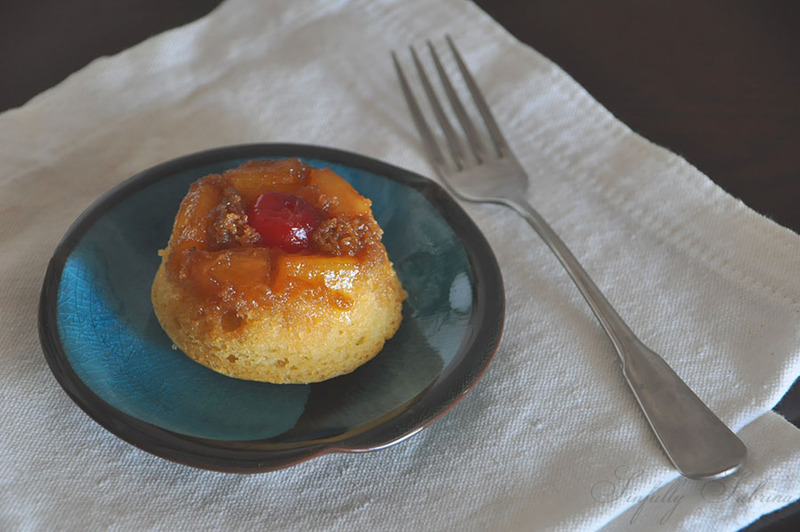 When the airline stopped making the pineapple upside down cake, my mom looked for the recipe and made it especially for me. If you knew my late mother, you would know that she can probably only cook/bake 5 things: how to make an incredibly crunchy sunny side up (which is still how I like my sunny side up), leche flan (creme caramel), polvoron (a Filipino milky and powdery snack), angel food cake and pineapple upside down cake. This would be the mother of all nostalgic treats for me. This recipe is not an upgrade, it is more of the classic cake made mobile. I turned it into pineapple upside down cupcakes. All 24 pieces were devoured in less than 48 hours. I think the boys thoroughly enjoyed them. Mix melted butter, salt and brown sugar. Divide and scoop 1 heaping tsp. at a time in the bottom of each muffin pan, arrange your pineapple tidbits and place the maraschino cherry in the middle. Pour vanilla cupcake batter, about ¼ cup at a time. I use an ice cream scooper. Let cool and gently run your knife around the cupcakes. Invert your pans, knock on each of the 24 cupcakes and PRAY! It should release the cupcakes with the pineapples and cherries in tact. This time, the fruit should look more like jewels and the bottom part of the cake should be glistening with the caramel.